For many years, people have been trying to find a way to get rid of bad breath and halitosis. Many people suffer from bad breath and halitosis. The desire to cure this embarrassing issue has supported a huge industry in breath mints, mouthwashes etc. However the most popular means of combating halitosis – tooth brushing and common mouthwashes – are not effective in treating chronic bad breath. They cannot reach the back of the tongue where the main odour-causing bacteria reside. If you are interested in how to get rid of bad breath, these “remedies” are not the answer. They merely mask the problem for a brief time, but do not eliminate the source. Socially Bad breath sufferers often experience heightened anxiety in social settings, avoid face-to-face encounters or get-togethers in small spaces. 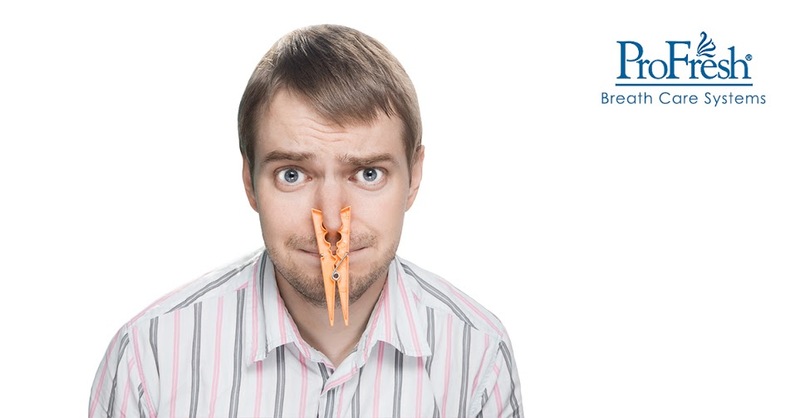 Many people who suffer from bad breath develop a negative self-image, and isolate themselves from others. This may cause them to avoid important occasions and can restrict their ability to lead fulfilling social lives. Professionally Having halitosis in the workplace can, at best, lead to uncomfortable moments with co workers due to self-consciousness at meetings, lunches and other periods of direct interaction. For the worst sufferers, it can narrow opportunities for career advancement. Personally Halitosis can especially hinder the personal lives of those who suffer from it. They often avoid intimate displays of affection with their spouses or children, due to the discomfort that their breath causes them. What’s worst is that halitosis can be a severe obstacle to a rewarding love life, as it negatively affects one’s appeal in intimate situations. ProFresh® was created specifically for this reason. No one should have to fear the social side-affects of halitosis. Nor should sufferers have to spend every minute of their lives worrying about their condition. ProFresh® allows everyone to live a life beyond the stress of bad breath. Why have I got chronic bad breath? Some people have temporary bad breath, caused by medication, spicy foods or dieting but 90% of people with chronic halitosis suffer from excessive build up of certain halitosis-causing bacteria on the back of the tongue and tonsil stones. People with chronic halitosis have large amounts of volatile sulphur compounds (VSC’s) produced from the breakdown of proteins by bacteria in the mouth. Not all sufferers from chronic halitosis are aware of their condition. Though awkward, one of the best ways to tell if you have bad breath is to ask someone you trust. We appreciate this is very difficult but it’s an accurate way to find out if you breath is sweet “or sour! Dentists are generally poorly informed about halitosis and how to treat it. Tongue scraping with a proper tool, in conjunction with good oral hygiene will also temporarily alleviate bad breath. However, the underlying problem remains – volatile sulphur compounds that rebuild on the back of the tongue and so the cycle of bad breath continues. In 1992, Dr. Jon L Richter founded the first clinic in the USA dedicated to finding a lasting halitosis cure. In a clinical trial study, he discovered that a safe germicide called chlorine dioxide was highly effective in removing the leading halitosis causes (mainly VSC’s). More than 99% of the 600 patients undergoing halitosis treatment found that using the chlorine dioxide rinse after tongue cleaning eliminated their chronic halitosis. Dr. Richter’s halitosis cure is now available for use in your home. 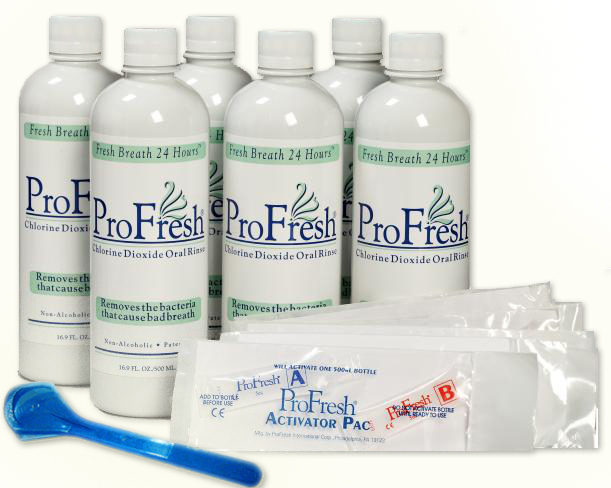 The ProFresh® Breath Care System includes everything you need. By following this easy 2-minute halitosis treatment plan twice daily, you too can experience the benefits of ProFresh® – the halitosis cure. Now Dr. Richter’s bad breath and halitosis treatment is available in the UK! If you truly want to get rid of bad breath at its source, then Dr. Richter’s ProFresh® Breath Care System is for you. ProFresh® is the only breath product that contains activated chlorine dioxide which has been clinically proven to eliminate odour-causing bacteria found on the back of your tongue. The secret about how to get rid of bad breath is out! ProFresh® has helped thousands of people – why not you?